The strongest emotion that I experienced during this movie was sadness. There are some great shots, some satisfactory action scenes, but to summarize this movie with a singular emoticon, it would be a 😦 with tears streaming down. Jake Gyllenhaal is in this movie for about a third less than I anticipated. Yet, he still stood out to me as one of the most intriguing characters. He is a reckless hippie with a strong passion for Grandpa’s old, cough medicine, and eventually succumbs to his stubbornness to play by the rules. 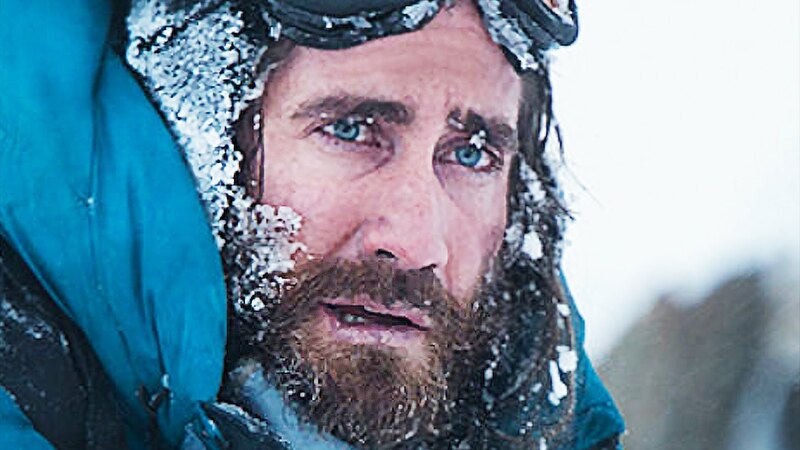 Gyllenhaal is the most unpredictable actor in Hollywood at the moment. I could never and would never attempt to climb Everest or any mountain remotely close to its tremendous size. I genuinely believe that humans aren’t really meant to attempt such a feat. We can’t get planes or helicopters up there, what makes us think our brittle bones belong that high up? In my eyes, the idea of being that cold for that long is a vivid and accurate portrayal of Hell. It is ironic that many believe that Heaven is up above, but the highest point on the planet is actually an area where one’s nose could freeze off after five minutes. #Justsayin. There are scenes in this film that remind me of the Alberta winter. Yes folks, winter really is that brutal in the prairies. I wonder if little Sarah has any interest in climbing. Freezing to death, falling under ice and drowning, and being eaten by sharks remain the top three worst ways to die in my books. Jason Clarke is the best lead actor that no one has heard of. He has now starred in ‘The Great Gatsby,’ ‘Dawn of the Planet of the Apes’ and now ‘Everest.’ Say it with me – Jason Clarke. He ain’t going nowhere.